If there is one place that needs to keep its floors clean and free from dirt and bacteria, it’s a hospital. With the constant foot traffic and potentially harmful or even deadly bacteria that can be left on hospital floors, investing in commercial floor cleaning machines has never been a higher priority for such organizations. While the traditional mop and bucket system worked for a while, it has been proven that mops do not actually pick up the dirt, but simply dilute it and spread it around. It may look like you are getting rid of the dirt but in reality, you aren’t. The other big problems with a mop and bucket are the labor hours that it takes to get the job done, the waste of water and disinfectant and the potentially harmful wet floors it leaves behind. Slips are a big problem in every commercial space, and are often largely a result of wet floors. A business or commercial space that cleans its floors using a mop and bucket is far more likely to report injuries from slips than a business that uses an automatic floor scrubber. All modern floor scrubbers will have a self-tracking squeegee that will leave the floor behind the machine dry after use. This alone can vastly reduce the number of accidents that people will have on wet floors. This is something that hospitals and healthcare facilities should seriously consider as the less chance there is of a slip or fall, the safer all patients will be and the more confidence they will have in their hospitals. The one benefit a mop and bucket had going for it was that it was quiet. This suits hospital and healthcare facilities perfectly as the less noise there is, the less disruption for patients. While an ordinary automatic floor scrubber may make slightly more noise, the best ones are virtually silent. 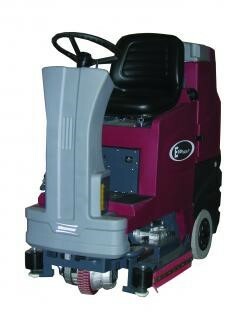 When looking for an automatic floor scrubber, you should look for one that makes less than 70 decibels of noise. There are many other things to consider when looking at an automatic floor scrubber for a hospital or healthcare environment, but all these machines definitely beat the old mop and bucket system all the time. To make a more informed purchase decision, be sure to talk about your options with experts.